Local seniors fight the city's plan to build affordable housing at the site of the Elizabeth Street Garden. NOLITA — Rising rents have caused some local seniors to support building affordable housing on the side of a treasured community garden. The city's Department of Housing Development and Preservation applied to the Lower Manhattan Development Corporation last month for $6 million to construct a seven-story building with ground-floor retail and 60 to 75 units of affordable housing for seniors on the site of the Elizabeth Street Garden. The LMDC held a public hearing last week to determine whether several projects, including Elizabeth Street Garden, have the strong community support required of all initiatives they fund. Seniors used it to explain why they need affordable housing in the neighborhood. “I’m using all of my Social Security to pay my rent,” said Tom Connor, who has been retired for 18 years and has seen his rent go from $185 to $2,000. “I love gardens but I don’t want to have to sleep in gardens at night,” Connor added to cheers and applause. Connor is a member of Community Board 2, which has long advocated for the Elizabeth Street Garden, and has members involved with the park's volunteer organization called Friends of Elizabeth Street Garden. CB 2 leadership passed a resolution urging LMDC not to fund the housing. But the resolution was never discussed by the full board, and Connor was not the only CB 2 member to break ranks. Longtime CB 2 member Maria Passanante Derr pointed out that Mayor Bill de Blasio’s plan for 200,000 affordable units over the next decade will require each of the city's 59 community districts to have 3,389 units. The 60 to 75 units expected at 21 Spring St. would be a drop in the bucket, she said. Derr struggled to be heard over heckling from garden supporters that packed the meeting, prompting a scolding from LMDC President David Emil to “be quiet and respect” Derr’s comments. Councilwoman Margaret Chin, who secured housing at that site back in 2012, highlighted the recent plight of elderly, lifelong Little Italy resident Adele Sarno who faced eviction from her apartment above the Italian American Museum because of rising rent. “When the time came to move out it was impossible to find an affordable apartment for her in the neighborhood that she loved,” Chin said. The housing plan predates Elizabeth Street Garden, and the garden was largely inaccessible to the public for decades. Locals who decided to try to open it to the public in 2013 quickly discovered the city's housing plan, but pushed forward anyway. Some garden supporters said the space was promised as a public "recreation area" back in 1981 when the city sold part of the lot to the Little Italy Restoration Association Apartments Co., or LIRA, to build 152 units of Section 8 affordable housing. Those units still stand, and the families and seniors who live there use the garden, they said. 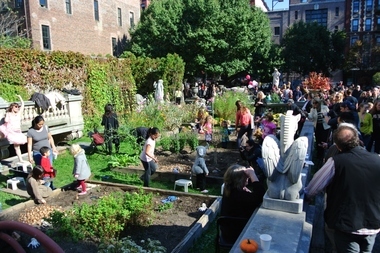 "Believe me, that garden is a wonder to all our children, our grandchildren and we don’t want it taken away," said Carmella Livoti, a resident of the 21 Spring St. But others objected to prioritizing the garden for the benefit of people who already have homes they can afford. “For those of us with housing to choose an amenity over a home — I don’t understand that,” said one woman, who called the garden “a showcase for pricey art objects." LIRA was supposed to develop and maintain the public park promised back in 1981, according to Community Board 2 records. But the derelict lot was untouched until the owner of the adjacent gallery began leasing it from the city in 1991. He cleaned it up and used it to store some of his sculptures, allowing occasional access through the gallery to people who knew to ask until the garden volunteers came along in 2013. The volunteers want the city to officially designate the lot as parkland and build housing elsewhere. Recommendations included an empty lot on Delancey Street, a city-owned garage at Howard and Lafayette, a parking lot on Baxter Street, the space atop a one-story city-run health clinic at 34 Spring St., and various lots in Hudson Square, where zoning was recently changed to be more appealing to affordable housing developers. An HPD official at the hearing said the project — estimated to cost up to $24 million — will move forward with or without the LMDC funding. A spokesman for LMDC said they "will review the community's input and make a recommendation to the full LMDC Board of Directors at the Board's next meeting." A date has not yet been set for that meeting.